Dying in prison is an awful thing. There is little positive that can be said about it. In Nebraska's State Penitentiary there are a hundred and forty-six men and women who completed their sentences by dying behind its walls and being buried in the prison grave yard known as Grasshopper Hill, or Dairy Hill, depending on who you talk to. Every type of person is represented by those buried there. Men and women and even one entire Pioneer family who, while on their way to California, became ill and died at the front gate of the prison. Beginning in 1874, anyone who died and had no one to claim their body was buried on The Hill. Considering that the United States fought in so many large engagements during that stretch of time, there had to be several Veterans of military service buried on this God-forsaken lonely hill. Since the end of the Vietnam War the living veterans residing in the Penitentiary have formed an organization of mutual support, now known as Post NEI-20 of the Vets of the Vietnam War Inc. 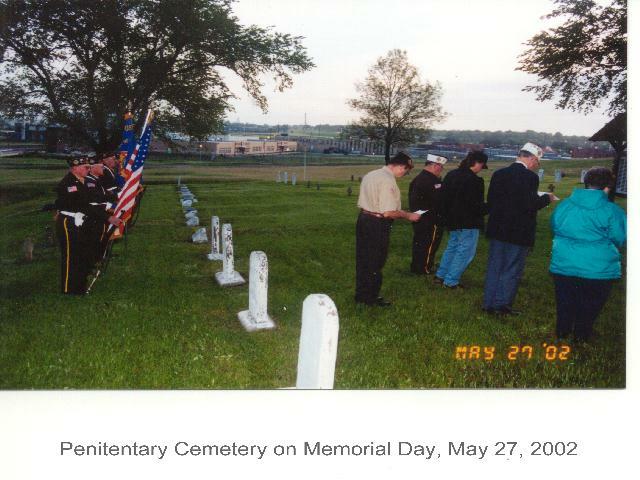 This group undertook the task of identifying those of military and obtaining proper headstones for their graves, regardless of the type of discharge from the service they may have had. Any honorably discharged veteran is entitled to a military headstone through the Veterans Administration. The government furnishes the stone, but the group requesting it must pay for its installation. Thus began an eight year mission to have these veterans honored for their military service. For the past many years the free world veterans of VFW Post 3606 have loyally made the journey each Memorial Day morning to The Hill to render armed military honors to the soldiers buried there. 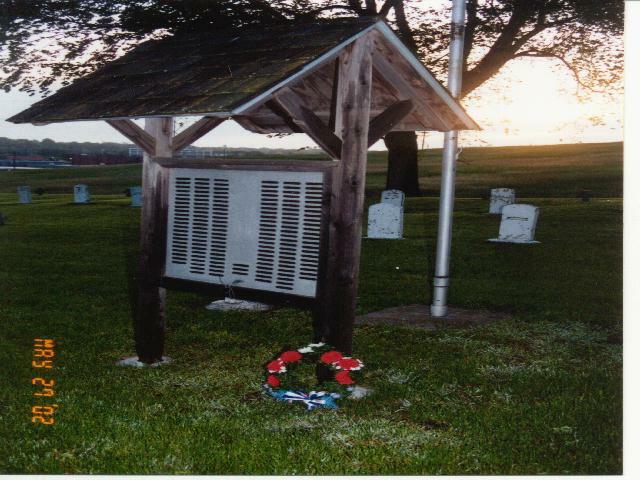 They did this for many years without knowing if any graves contained the remains of veterans, or exactly which of the small stones with only an inmate number on it was the grave of a former soldier. Many of these "Old Boys" would be the contemporaries of the men laying asleep on The Hill. They would often wonder about their comrades, as to which graves ought to have a small American flag placed on it. The Veterans Group long-standing volunteer, Jaime Obrecht, himself a combat Marine veteran of Vietnam, encouraged and was instrumental in seeing this mission through to success. Without his determination in working with the prison staff and others, this mission would have failed. Obtaining records and documentation of exactly who was buried on The Hill was not easy. Then to find out which inmate was a military veteran was even more daunting. The Nebraska State Historical Society had microfilmed the old "Fire Books", which is the basic record of an inmate's name and physical description and sentence. The books were so named because if ever there was a fire at the old prison records office this was the one book officials would save from the flames. Included in it were such things as a person's foot size which was a main point of identification before fingerprints were used. In some cases the fire books listed an inmate's military service, or descriptions of military related tatoos. After all, who but a veteran of WWI would have a tatoo with an American flag and wording saying "No Mans Land" on his arm? No Mans Land being the name given the area between opposing forces in WWI trench warefare. Many surprising facts began to emerge from the Fire Books and other sources. 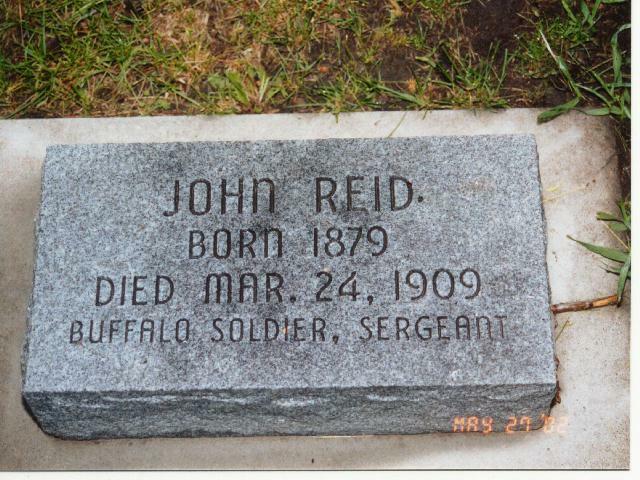 Sergeant John Reid had been stationed at Fort Robinson in 1905, leading the Buffalo soldiers 9th Cavalry. He came into conflict with the law as a result of nearly defeating a local Marshall in the annual Fourth of July horse race in the town of Crawford. Where Marshall Moss used his whip on Reid's horse making it break stride so that he could win. Later that fall Sgt. Reid and one of the Cavalry Troopers were in Crawford celebrating. Marshall Moss confronted the pair and ordered them to return to the fort. Reid refused and reached for his service revolver. Both Moss and Reid got off shots, but only Reid's found its mark, killing the Marshall. Reid and the trooper then ran for their lives from townsfolk who intended to take them into custody. The trooper was shot and killed, and Reid was later found hiding in a friend's house. While Reid was in the Crawford jail, such was the talk of the town that it was feared either his fellow troopers, who had gone AWOL would come and break him out of jail, or that angry townsfolk would avenge his killing of a popular Marshall that a company of white soldiers was ordered to the jail for security. Their services were needed as a man stumbled out of the local tavern and charged the jail with pistol in hand, meaning to kill Sgt. Reid. One of the troopers fired after challenging him and killed the would-be attacker. Reid was then moved to a more secure jail, and then sentenced to seven to ten years for manslaughter. Until his death due to TB, Reid's commanding Officer made a monthly trip from Fort Robinson to the Penitentiary to visit his loyal Cavalryman. In the records obtained from the old prison files it was discovered that even before the FBI had been created J. Edgar Hoover himself had held an interest in one of those buried on The Hill. In Arthur Slater's file was a personal letter from Hoover as head of the Criminal Investigation Bureau detailing that Slater, also known as Roy Martin, had been wanted in connection with several cases of "Burglary with Explosives" in the Kansas City area. 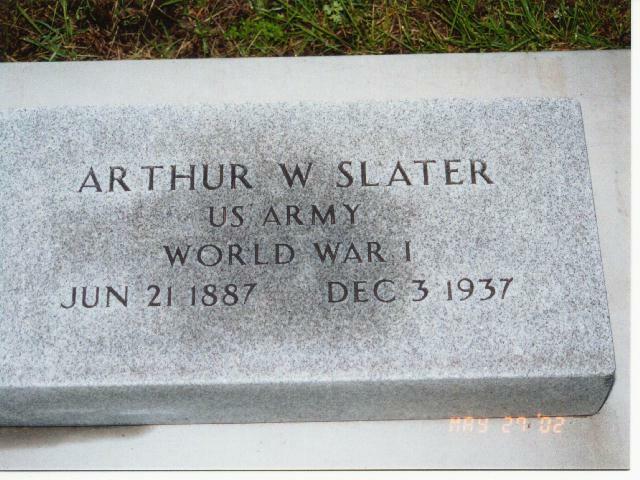 Slater had been incarcerated here at NSP under the name Roy Martin, but had later applied for Veterans medical benefits under the name he had served in the Army under, Arthur Slater. His prison records related where he had learned his expertise in explosives, helping build the Panama Canal. That was until the Yellow Fever became so rampant that he and several others deserted. But when the United States entered WWI, he was allowed back in the Army and served honorably in the 80th Division. Lee Gaskin was another Buffalo Soldier, serving in the 9th Cavalry, 32nd Division during 1909-12. But in his records it shows that he had lied about his age and at sixteen-years old had served in the Philipines while Teddy Roosevelt was busy charging up San Juan Hill in Cuba. A force comprised mainly of the Buffalo Solders of the 10th Cavalry. A fact seldom portrayed in the movies. The veteran with the most mystery surrounding him who ended up buried on The Hill was Sgt. William "Bill" Fitzgerald. 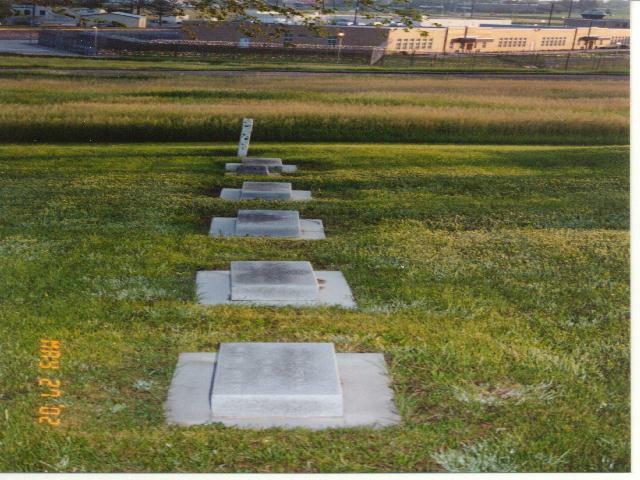 He ended up in this "potter's field" of unclaimed bodies after contracting venerial disease during a five year sentence for writing a thirty-dollar bad check in 1955. Fitzgerald had made some big claims about his Hollywood connections in his prison records, but there is reliable evidence supporting his claims. Fitzgerald was born in Southern California and during the 1930's had won several middleweight boxing titles sponsored by the California Catholic Youth Authority. Later he fought and nearly defeated Billy Conn, who later took the Heavyweight Champion, Joe Louis, the distance in one of the Brown Bomber's hardest fought victories. His photo in the ring shows him to be quite a dashing character, resembling strongly John Kennedy Jr. Perhaps that may be a family connection. Fitzgerald also claims to have been a bodyguard for actress Jean Harlow, right up to the time of her mysterious death. That may be more than likely if he is part of the Fitzgerald family, which was the maiden name of President Kennedy's mother, Rose. Somewhere Fitzgerald's life crossed paths with an up-and-coming actress of the 40's named Gloria Dickson. Best known for her role in the boxing expose' entitled "They Made Me a Criminal". It may be likely that on the set of this movie, which also starred John Garfield, that sparks of romance were ignited between Gloria and Bill. They later married, but WWII also erupted and Fitzgerald went off to war in the Marine Corps. The military files of this man reveal another mysterious story. He had served in the Marines from 1932 to 1942, mainly aboard the Carrier Saratoga. Then he suddenly goes AWOL in May of 1942. An odd time for Marine Sergeant to desert, just a few months after Pearl Harbor. Then without so much a reprimand in his records, he returns to the Corps in August of 1942. In the news clippings from the Hollywood entertainment papers the story of his being wounded in the South Pacific in a battle just prior to the conflict of Guadalcanal is related. The papers note that he is seen escorting his movie star fiancee Gloria Dickson, while recovering from his wounds. After their marriage, tragedy comes into play when the house that he and Gloria are renting from Sidney Tolar, (aka "Charlie Chan") burns down. Fitzgerald races home from the movie studio and has to be held down to keep from entering the burning house, shouting "My baby's in there." The loss of his "baby" in the fire is more then he can take. In late 1944 he goes "over-the-hill" as he puts it in his prison file. He becomes a long-haul truck driver, until arrested for desertion in time of war in 1950. He serves time in the military brig in Plattsmouth, New Hampshire, and is dishonorably discharged in 1951. Apparently he was still quite the ladies man as he married a woman from Darr, Nebraska. A Reno wedding that lasted less than one month, when she found that Bill had been writing bad checks on her account. The last one being the reason he was sent to prison. It was written at the Castle Hotel in Omaha. At the time, a well known location for prostitution. Now why would a man with such notable history and connections end up here in a lonely prison graveyard? He had several prominent media and legal people listed as his contact people in his files. Why would anyone, especially a WWII combat Veteran get such a severe sentence for a thirty-dollar bad check. Maybe that harsh sentence was given to him because he was exactly who he claimed he was in his prison records. Maybe the justice system of the time felt he needed to be brought down a peg or two. That same feeling may have carried over to the prison staff in that day. When he died they did not bother to notify anyone of his death, or surely his body would not still be laying up on that lonely hill. In his prison records notations of doubt about his claims are written, doubting his Hollywood connections. Claims that could have easily been verified with just a phone call, but were not. The real motivation behind the headstone project came to an emotional head when the daughter of one of these forgotten veterans was located. Donna Wendzillo, a past member of the Ponca Tribal Council, is the daughter of John Mackey. This Santee Sioux veteran had served in the Marine Corps in WWI, but was given a less than honorable discharge. He was a well known baseball player who was featured in several magazines and scouted by the Yankees. But instead he ended up in prison as a co-defendant in a Niobrara murder case. Mackey's daughter, Donna, had been in her teens when her father died. He had sent her little toys he had made in the prison wood shop. He had kept a picture of her and when he died the prison sent that to Donna. During the years following his death, Donna had been unable to afford a headstone for her father's grave. When she learned of the Vet's Group headstone project she only asked that the words "beloved father" be engraved on her father's headstone, which they were. In a way, that helped to heal the hurt of his passing so many years before. She came down from her home in Sioux City to attend the dedication program of the newly installed headstones. One of the Native American veterans performed a drying of the tears ceremony using a sacred feather to symbolically dry Donna's tears. The ceremony was more than just symbolic, for her and all who attended, it was very real. Now among the rows of old wooden crosses and old stone inmate number markers, there are new headstones that honor the service of these long-forgotten servicemen. Some have asked why bother honoring these men after all this time? The answer is simple. Above and beyond the healing that it brought to Donna Wendzillo, remembering those who served the country in the past, insures that those who serve it now will also be remembered for their service. Veterans deserve more than just their names on a small plaque as the prison had done. Now things have finally been made right in the grave yard of the state penitentiary. Photos Courtesy of Lawrence Obrist, Vet Center, Lincoln, NE.